Located 200 kilometers north of Chad’s capital N’Djamena, Lake Chad is one of the oldest lakes in Africa and supports approximately 300 million along its shores in Niger, Nigeria, Cameroon and Chad. Since the early 1970’s, the basin has shrunk from 25,000 square kilometres to 2,000 square kilometres. Statistics indicate that the lake has lost 90 percent of its original surface area due to climate change and unsustainable water management. Climate change is having a devastating impact on the Lake Chad region which is highly dependent on seasonal rainfall and susceptible to evaporation. In northeastern Nigeria and its surrounding countries, Boko Haram has displaced more than 2 million people and destroyed basic infrastructure including housing, medical centres, farms and roads. According to the UN Office for the Coordination of Humanitarian Affairs, 7 million people in the region face the threat of famine and half a million children suffer from severe malnutrition. Predictions note that 35 million people will depend on Lake Chad’s resources by 2020. 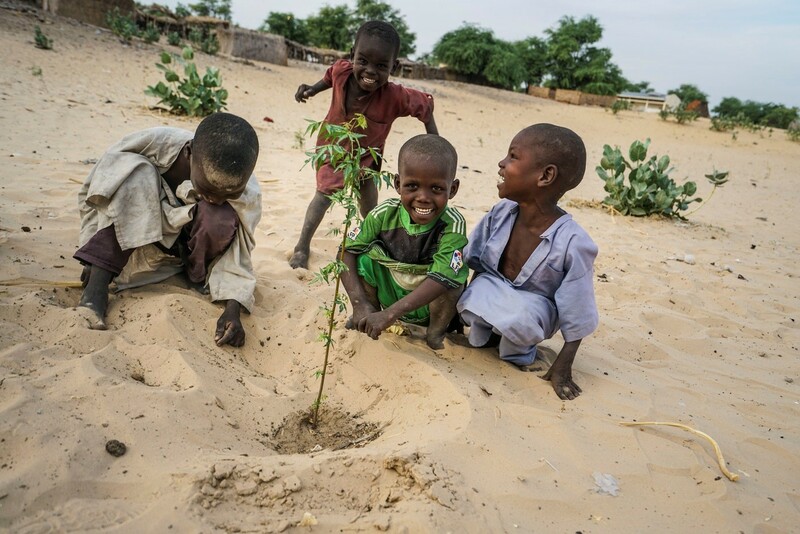 In collaboration with its partners, the United Nations Development Programme (UNDP) carries out development projects that focus on the rehabilitation of Lake Chad’s ecosystems and the natural resource management. The Ministry of Ecology signed a US$1.7 million partnership agreement with the UNDP to support women’s economic initiatives, help adapt agricultural practices to climate change and restore vegetation cover around the lake. As part of the project drought-tolerant seedlings will be planted over 4,000 hectares to protect the polders from silting. Across Merea, Liwa and Tantaverom, 40,000 acacia trees have been planted to date. Across these areas a community elected a committee ensures the success of the project and oversees its implementation. UNDP has donated agricultural kits to over 400 households around the lake to fight poverty and improve food production. In order to prevent radicalisation and violent extremism, reintegration activities will be implemented through a multiyear Integrated Regional Stabilisation project. About 4.8 million people will indirectly or directly benefit from the implementation of the project.